For popcorn-throwing movie parties only. At the end of the religious nut killer thriller "Frailty," my eyes were so sore from rolling at the film's predictability and narrative loopholes I could barely see straight. The directorial debut of actor Bill Paxton ("Titanic," "Twister") -- who also plays the movie's ax-wielding mad dad who considers himself a demon-slayer doing God's will -- the movie opens with good ol' boy Fenton Meiks (Matthew McConaughey) dropping in at the office of an FBI agent (Powers Boothe) to spill the beans about a serial killer in the family. It seems that when he was a boy, his widowed father (Paxton) started killing people whose names he said he got from God. It wasn't long before his younger brother got into the act too, and Fenton has been holding on to this dark secret since he was 10. But now, he says, it's time to turn his brother in as the "God's Hands" killer that the feds have been hunting for years. Little more than a "Usual Suspects"-like structural gimmick for a five-reel flashback, in these modern day scenes Boothe must play a laughably inept detective who never, ever asks a sensible question, but just listens skeptically as McConaughey spins the yarn of his youth. As his story unfolds, we see 10-year-old Fenton (Matthew O'Leary) struggling to accept what his father tells him: God has given him the ability to see demons disguised as humans and it is their family's holy duty to kill them. A series of adequately chilling kidnappings and murders follows as Fenton withdraws from his father and little brother Adam (Jeremy Sumpter), and refuses to participate. Soon he starts to fear he'll be his father's next victim -- especially after he's locked in a cellar for days on end and told he must stay there until God comes to him with the same visions his father and brother share. Fenton believes that Dad has lost his sanity and that Adam is just afraid to disobey. But he's scared and he doesn't know what to do about it. As a director, Paxton does raise some goosebumps in "Frailty," and he does it without resorting to blood and guts. 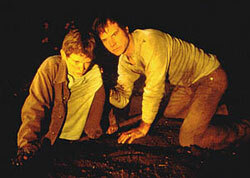 There's a steady current of anxiety and dread achieved through the performances alone as Paxton the actor plucks unsuspecting people from their everyday lives and takes them to his cellar, lays hands on them and convulses with visions of their evil deeds (which, by the way, hardly makes them "demons") while the soundtrack jumps and jolts. Paxton the director made a smart choice casting Paxton the actor, who puts to good use that strangely detached acting style that often renders him unconvincing. Here he comes off as eerily disturbed and zealously menacing just by adding a little fearful determination in his eyes. But what Paxton the director doesn't do is maintain any semblance of suspense. In fact, he often has a problem with common sense as well. The modern part of the story -- in which McConaughey leads Boothe, in the middle of the night, to the site where his father buried his victims -- is so contrived and improbable that when Paxton tries his hand at plot twists anywhere in the movie, most moviegoers will already be two or three steps ahead. "Frailty" plays as if its been drawn from a 50-year-old B-thriller script, written in an era of hackneyed dramatic-pause dialogue, when moviegoers were more naive, more easily frightened and less likely to snicker at a character's inherent stupidity.